Data obtained within HBP’s brain atlas work has contributed to the discovery of a "short distance" brain connectivity deficit that is associated with a lack of social interaction and empathy. 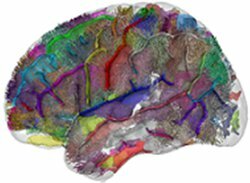 As part of the InFoR-Autism* scientific program involving the french Human Brain Project (HBP) partner NeuroSpin, a new neuroimaging study has revealed a correlation between decreased local anatomical connectivity and social cognitive deficits in people with autism spectrum disorders (ASD). Published in the renowned journal Brain, the results challenge the dominant theoretical model explaining ASD and could pave the way for the exploration of new therapeutic approaches. The researchers used critical high-resolution neuroimaging data for the analysis that were obtained as part of the creation of the HBP Brain atlas. Autism Spectrum Disorders (ASDs) are caused by developmental disruptions characterized by communication disorders, altered social interactions and sensory and behavioural abnormalities. Research in genetics and brain imaging suggests that alterations in brain development, including the formation of neural networks and the functioning of synapses, may contribute to the development of ASDs. In recent years, neuroimaging studies have shown that people with ASDs have abnormalities in the functioning of certain brain areas known to be responsible for processing emotions, language or social skills. Research on the brain connectivity of people with ASD has shown in particular a lack of "long distance" connections in contrast to an increase in "short distance" connectivity. These results formed the basis for the development of a theoretical model for understanding ASDs, according to which the lack of social attention and information processing (difficulty in understanding a situation as a whole, attention to detail) is explained by an oversaturation of information processed within the brain, linked to the increase in neural connectivity between adjacent brain areas. At this point, an innovation from the Human Brain Project (HBP) provided a way to test the current model. Within the HBP, scientists throughout Europe collaborate to integrate vast amounts of neuroscientific data into the most comprehensive model of the brain to date as a resource that is open to scientists and clinicians worldwide. Neurospin is one of the central partner institutions in this endeavor. 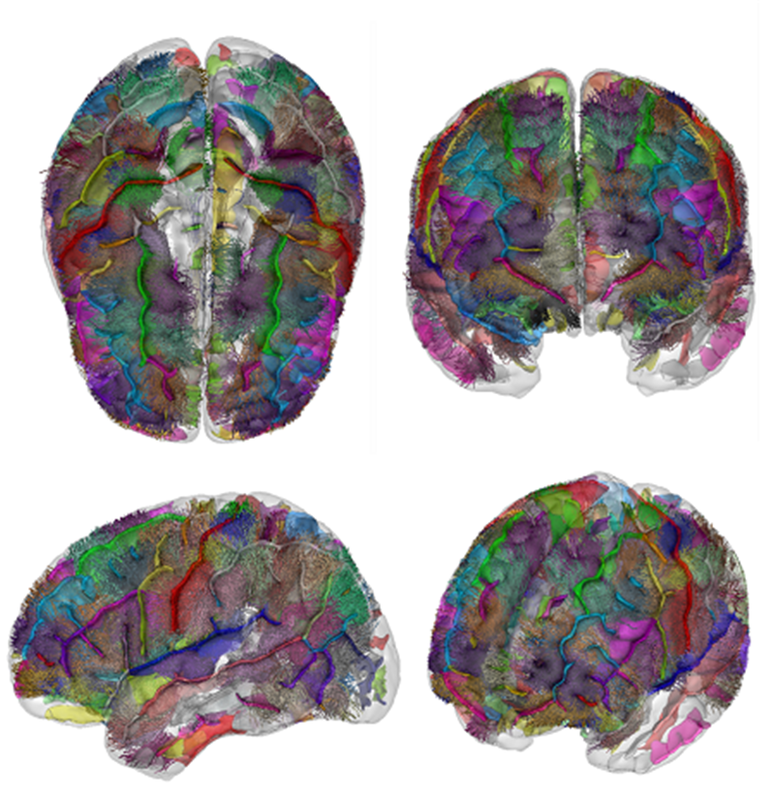 As part of the work scientists Miguel Guevara, Jean-François Mangin and Cyril Poupon from NeuroSpin had created an atlas specifically dedicated to the tractography of 63 "short distance" connections from images obtained by diffusion MRI (dMRI). This method allows highlighting the white matter fibres of the brain in vivo by measuring the diffusion of water molecules, especially along axons. It is then possible by tractography to reconstruct the paths of the nerve fibre bundles represented in the form of a tractogram. The authors were thus able to study the links between "short distance" connectivity and social cognition in a homogeneous adult population of people with ASD from the InFoR-Autism* cohort (27 persons with ASD without intellectual disabilities and 31 control persons). "The power of the InFoR-Autism* cohort lies in the great richness of the data collected for each subject included. We were thus able to link the neuroimaging results obtained with social cognition scores, measuring social ability, empathy, social motivation, etc.," recalls Dr Marc-Antoine d'Albis (HU Henri Mondor, Inserm U955), first author of the study and also a researcher at NeuroSpin. The results obtained show that subjects with ASD have a decrease in connectivity in 13 "short distance" fibre bundles compared to control subjects. In addition, this anomaly in the connectivity of "short distance" connections is correlated with a two-dimensional deficit in social cognition (social interactions and empathy) in subjects with ASD). These preliminary results are in stark contrast to the current theoretical model that the lack of social attention and information processing in people with ASDs is due to an increase in neural connectivity between adjacent brain areas. They now need to be confirmed by studies conducted in children with ASDs, as explained by Professor Josselin Houenou. To integrate the ever-growing high-resolution data from brain science labs across the world into a common framework, the Human Brain Project creates an ambitious new brain atlas system that runs on a network of European Supercomputers, but can be accessed from the webbrowser by any researcher or clinician worldwide. By linking data and different maps from all areas of neuroscience the project wants to create an open digital resource and tool of choice for neuroscientific exploration, akin to a “Google Maps of the brain”.